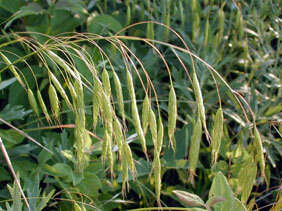 Also Called: Japanese bromegrass, japanese chess. Culms: Erect or spreading, slender, bent at base; nodes swollen, brownish. Blades: Flat, 3 to 8 inches long, .1 to .2 inch wide, usually densely hairy with conspicuous gray hairs, midrib prominent. Inflorescences: Panicle, open, 3 to 8 inches long, usually drooping to one side when mature; branches of different lengths, in whorls, spreading, often zigzag, each branch bearing 1-5 spikelets at tip. Spikelets: Flattened, often hairy, .6 to 1 inch long, about .2 inch wide, 6 to 13 flowered; awn prominent, 1/4 to 3/4 inch long, often bent or twisted at maturity. Habitat: Found in dry or moist waste areas, disturbed sites, fields, or roadsides. Forage Value: Can provide good forage value when grazed early in the growing season. Uses: Prairie chickens are known to consume the seeds. Comments: A widespread weedy grass that forms colonies.